Italian born, Philadelphia based, singer songwriter Jacopo De Nicola mixes Old and New World influences into a sophisticated sonic cocktail. Expanding the tradition of the Italian Cantautori, Jacopo charms listeners with infectious upbeat tunes as well as introspective ballads and protest songs. 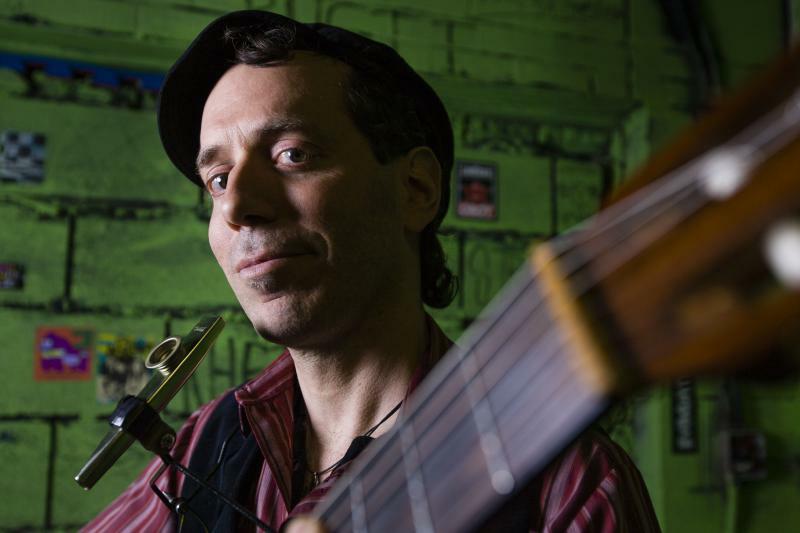 His eclectic repertoire is ﻿﻿propelled by a rhythmic Gypsy/World pulse and punctuated by virtuosic kazoo melodies that have become a signature of his live performances.﻿ De Nicola performs internationally as a solo artist and in the United States with his gypsy-rock band The Late Saints. After training as a bass player in Italy and performing with a vast array of bands like new wave group The Shades of Gray, traditional Italian folk ensemble Giancarlo Corrente's Orchestra and experimental techno-jazz trio The Spacecakes, Jacopo picks up a battered classical guitar at the turn of the millennium and begins writing his own music. In the summer of 2005 he decides to walk the Camino De Santiago, a profound and changing experience that eventually leads him to move to the United States in 2006. Landed in San Francisco he collaborates with numerous local musicians, performs solo, forms a band and releases his first album "Mai Come Ora" (2009). In addition to his live performances and songwriting, Jacopo designs sound for various art projects including actress/director Marilee Talkington's theatrical sound piece titled "The Wormhole" and independent video artist Amy Hicks' films. In 2010 he relocates to the East Coast where he records his second CD "Torn in The USA" (2010), performs live in the Wilmington / Philadelphia area, forms a new band "The Established" (with Joshua Ramey on drums and Andrew Nelson on bass) and produces a few albums in collaboration with fellow musicians. In 2012 he releases the EP "Oceano senziente", a detour from the previous style that combines traditionally arranged songs with an EDM rhythmic canvas. In early 2013 he founds the new project "The Late Saints", a philly based gypsy rock trio with Micah Hebbel on Drums and Jason Bachman on Bass. Intended as an expansion of his solo music, The Late Saints gain immediate momentum for the originality and great energy of their live performances. In Fall 2015 the band releases their long-awaited first album "Presto!In America", and features a new line-up with Mike Huff on bass, Tim Leslie on Percussion and additional brass section with Nick Lombardelli (bone) and Alex Wolfe (trumpet).